Media Contact: Joanna Raczkiewicz 212.937.6580 x233 press@eyebeam.org www.eyebeam.org EYEBEAM ALUM JAMES POWDERLY DETAINED IN BEIJING No word from the American artist 24 hours after being taken into Chinese custody. Powderly was in Beijing to unveil a project made with pro-Tibet activist group New York City, August 19, 2008, 7:30PM EST- Artist and Eyebeam alum James Powderly was detained by Chinese authorities in Beijing early Wednesday, according to a message received by Students for a Free Tibet around 5PM Beijing Standard Time, said an SFT spokesperson. The message, sent through the social networking site Twitter, read "held since 3AM", said friend and SFT board member Nathan Dorjee. Powderly has not been heard from since-more than 24 hours later-and his whereabouts remain unknown, he said. "Freedom of speech has always been central to James' practice, and we support this commitment. Most importantly, we hope for his quick release," said Eyebeam Executive Director Amanda McDonald Crowley. Powderly was a fellow in Eyebeam's R&D OpenLab in 2005-2006, and a senior fellow in the OpenLab from 2006-2007. Powderly is also co-founder of the Grafitti Research Lab, a project developed during his fellowship at Eyebeam. 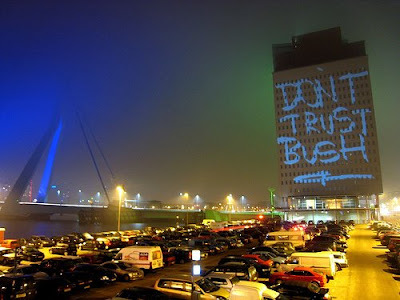 He was in Beijing collaborating with the activists to project messages onto the facades of prominent Beijing buildings using a laser beam and stencils. The artist was detained before the planned launch of the project-dubbed the "Green Chinese Lantern"-in which a beam of light would be used to display graphics and text on structures up to two stories high, said Dorjee. It is unclear how Chinese authorities learned of the plan. Also today, five activists with Students for a Free Tibet were detained after displaying a banner that spelled out "Free Tibet" in LED Throwies, the open source technology pioneered by the Grafitti Research Lab and popularized online and worldwide. This brings the number of SFT protestors detained in Beijing to 42. In the majority of these cases, the individuals were heard from and deported within 6-12 hours of their arrest, said Dorjee. Upon learning of the detention, fellow artist, collaborator, and current Eyebeam senior fellow Steve Lambert said, "He's an amazing, entertaining, brilliant, and committed person. Not all of us have the courage to travel to China to make such a statement at a key time like this. He's a great friend and obviously, like so many others, I'm concerned about his well-being. I hope he's allowed to return home as soon as possible." The L.A.S.E.R. Stencil technology is a modification of the GRL's L.A.S.E.R. Tag, which was featured in the 2007 Eyebeam exhibition Open City. This portable, updated version is the size of a flashlight, requires one person to operate, and is intended for use with homemade micro-stencils. Students for a Free Tibet, a group with more than 700 chapters worldwide, has been staging protests in Beijing over the course of the past two weeks.